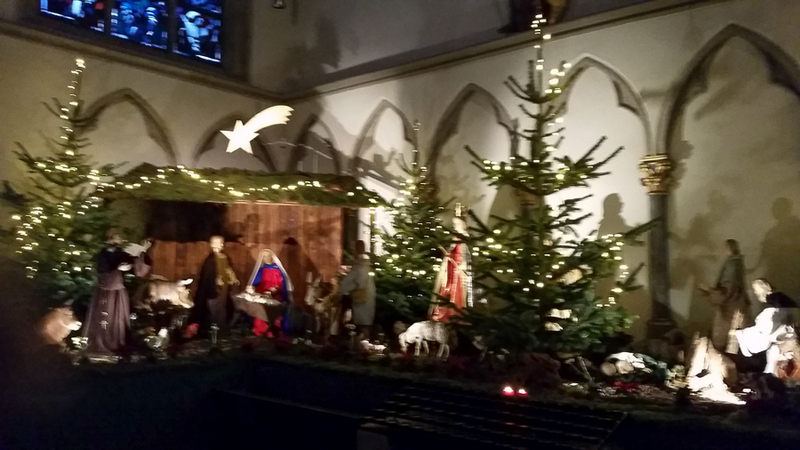 A Christmas crib in Cologne, Germany. There are many wonderful traditions associated with Epiphany. Saint John Cantius in Chicago gathers them here. In the Height and the Depth the Son had two heralds.— The star of light proclaimed Him from above—John likewise preached Him from beneath:— two heralds, the earthly and the heavenly. The star of light, contrary to nature, shone forth of a sudden—less than the sun yet greater than the sun.— Less was it than he in manifest light— and greater than he in secret might because of its mystery. The star of light shed its rays among them that were in darkness—and guided them as though they were blind—so that they came and met the great Light:— they gave offerings and received life and adored and departed. and that our true treasure may ever consist in our confession of you. This entry was posted in Christmas and tagged Christmas, Cologne, crib, Epiphany, Magi, Star, Wise Men on January 7, 2017 by frjfkauffmann.